Travellers Drink From Iceberg – Nature’s Water Fountain! Icebergs are one of the most spectacular natural phenomena of the Arctic. Coming in a variety of artistic shapes, sizes, and colouration, icebergs create irresistible photography. Close-encounters with soaring icebergs are a dream of many adventures and travellers alike. Travellers on our summer Arctic safari, Polar Bears & Glaciers of Baffin Island, love exploring the icebergs of Qikiqtarjuaq, Nunavut and Auyuittuq National Park by boat. 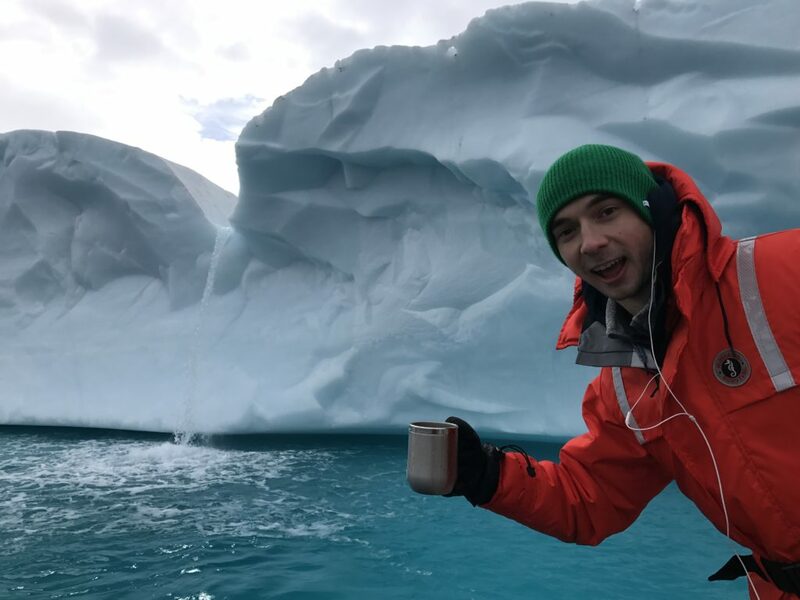 Guests on this trip in August 2017 got a special treat – the chance to drink from a melting grounded iceberg! This area of Nunavut is affectionately nicknamed “iceberg alley”, as it is home to many incredible icebergs. Most of these icebergs have calved off the Greenland Ice Cap, but some originate from the glaciers on Ellesmere Island, Devon Island, and Baffin Island. There are more than 10,000 icebergs afloat in the waters of Baffin Bay and Davis Strait, making them amazing locations for iceberg watching. The iceberg in this video is a massive tabular iceberg grounded off the coast of Baffin Island near Qikiqtarjuaq. It has been slowly melting since it grounded here almost 7 years ago. In the melting process, water flows over the berg and cascades off in a waterfall. During the long days of Arctic summers, the expansive surface of large icebergs often melt and develop fast-flowing rivers on the surface. The amount of water flow will change daily depending on the daytime and nighttime temperatures. On this particular day it was a beautiful sunny day in the height of summer, causing above-average flow – and allowing Arctic Kingdom travellers the experience of a lifetime! Want to have an experience of a lifetime on a trip to the Arctic circle? Get your chance to experience icebergs, as well as polar bears and bowhead whales in the Canadian High Arctic this August on Polar Bears & Glaciers of Baffin Island. Want to plan a private iceberg watching trip? Contact us today to create a custom itinerary. 10 Fun Facts About Narwhal: Are Narwhal Endangered?